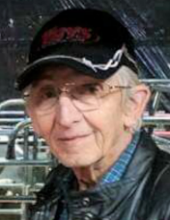 Roger Moyer, age 75 of Grinnell, died on Saturday, December 1, 2018 at Grinnell Regional Medical Center. A graveside service will be held at 11:00 a.m., Thursday, December 6th at Rock Creek Cemetery west of Grinnell. Pallbearers are Kayla Astelle, Jessica Cook, Haley Moyer, Doug Moyer, Kraig Schmidt, Danny McCulley, and Spencer Moyer. A reception will be held at 12:00 p.m. at the Grinnell Eagles. Visitation will begin at 2:00 p.m. on Wednesday at the Smith Funeral Home and his family will receive friends from 4:00 p.m. until 7:00 p.m.
Memorials may be designated to the Roger Moyer Memorial Fund, to benefit Grinnell Regional Hospice and the Jasper County Animal Rescue League, mailed in care of the Smith Funeral Home, PO Box 368, Grinnell, Iowa 50112. Memories and condolences may be shared with his family online at www.smithfh.com. Roger Keith Moyer was born on November 2, 1943 in Grinnell, Iowa to John and Mildred (Strong) Moyer. He was raised and educated in Grinnell. Roger was united in marriage to Joan Kae Kinnaird on July 3, 1964 at the First Baptist Church in Grinnell. They were blessed with two sons, Tom and Rick. Roger worked at the Deep Rock Gas Station in Grinnell for several years. It was later renamed to Moyer’s Kerr-McGee Service Station. He retired from the gas station in 1988 and was then employed at VanWyk Freight Lines in Grinnell until 2016. Roger was an outdoorsman who loved camping, fishing, riding his motorcycle, going horseback riding and attending rodeos with his grandkids. Roger also loved going to watch his granddaughter Haley race her Junior Dragster. He enjoyed just being with his grandkids and great grandkids. He also enjoyed his morning coffee and visiting with friends at A&M Café in Grinnell. His other enjoyments were watching WWE wrestling and old western movies on TV. Survivors include his two sons, Tom (Pam) Moyer of Ankeny and Rick (Monica) Moyer of Grinnell; five grandchildren, Kayla (Travis) Astelle of Newton, Iowa, Jessica (Ian) Cook of Cedar Rapids, Iowa, Haley Moyer of Grinnell, Matthew (Abby) Moyer of Grinnell, and Spencer Moyer of Grinnell; four great grandchildren, Lydia and Cyrus Versendaal and Ryker and Kylie Astelle all of Newton, Iowa; and his siblings, Allan (Shirley) Moyer of Grinnell, Dean Moyer of Estes Park, Colorado, Harold (Beverly) Moyer of Grinnell, Karol Gilliland of Marshalltown, Iowa, Mary (John) Schmidt of Grinnell, Joyce Lincoln of Stuart, Iowa. Roger was preceded in death by his parents; his wife, Joan in 2014; and his siblings, Arlene Pierce, James Moyer, Bob Moyer, Frank Moyer, and Maxine Osborn. To send flowers or a remembrance gift to the family of Roger Moyer, please visit our Tribute Store. "Email Address" would like to share the life celebration of Roger Moyer. Click on the "link" to go to share a favorite memory or leave a condolence message for the family.